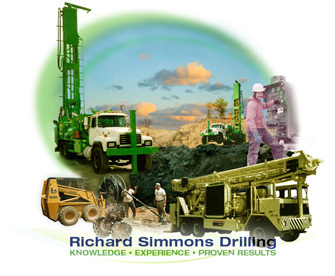 Since 1969, Richard Simmons Drilling Co., Inc., operating from the same location in Buchanan, Virginia, has provided continuous service to our clients throughout the Southeastern and Midwestern United States. We have earned a reputation for providing timely and cost-effective drilling services for: Geothermal, Environmental, Irrigation, Water Well, Quarry, Mining and Construction projects. We own and operate a variety of drill rigs (IR, Schramm, Drill Tech, Furukawa, CME, Tamrock, Gus Pech. Simco), all of which enables us to provide the right equipment best suited to your project. Each drill rig is typically supported with a service or tender truck with water tank, grout pumps and auxiliary equipment. Richard Simmons Drilling Co., Inc. and employees will treat you and your project with respect, hard work and timely results, no problem — guaranteed.